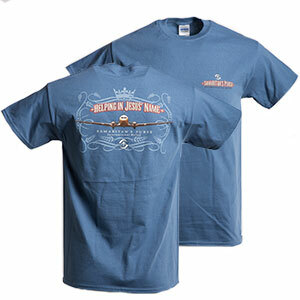 Spread the word about Samaritan’s Purse in this T-shirt made with 100 percent preshrunk cotton. With the Samaritan’s Purse slogan, “Helping in Jesus’ Name,” on the back, this short-sleeved shirt is great for when you’re out and about. Spread the word about Samaritan’s Purse in this T-shirt made with 100 percent preshrunk cotton. With the Samaritan’s Purse slogan, “Helping in Jesus’ Name,” on the back, this short-sleeved shirt is great for when you’re out and about..